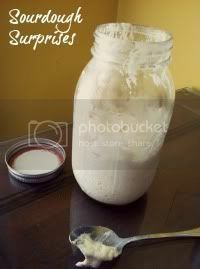 I was asked to join a group of bloggers (Sourdough Surprises) that enjoy using sourdough. Each month, the group is asked to make a recipe in a chosen category and submit it on the 20th of the month. I decided to join and participate whenever I can as I am always on the lookout for more sourdough recipes and this seemed like the perfect place to find and share new recipes. This month's topic is cookies. Since I have been away plus have been ill, I haven't done any baking lately. I do have two cookies recipes to share that I have previously made and posted. Just click on the cookie name and you will be linked to the original recipe. Sourdough Oat Chocolate Chip Cookies is my standby sourdough cookie. It is moist and chewy and filled with oats, chocolate chips and nuts. I adapted the above recipe and came up with Sourdough Peanut Butter Cookies . The cookies are a bit drier tasting, but most peanut butter cookies are. Thanks for linking up, Joan! Both of your cookies look really delicious!! Thanks so much for joining in the fun this month, and awesome looking cookies you made! I hope everything is going much better now and that you will continue to bake along with us! Sourdough and cookies seem to be made for each other, aren't they? I wouldn't mind both your cookies!